Probiotic Pearls Adult 50 Plus are an all-Bifidobacterium probiotic supplement manufactured by Enzymatic Therapy, Inc. Some boxes may show Nature's Way as the company, but the Nature's Way website is not listing this product as their own. Both Enzymatic Therapy and Nature's Way are part of the Schwabe Group and both share the same headquarters in Green Bay, Wisconsin, USA. This supplement is also said to have an advanced triple-layer softgel that protects the microbes from heat, air, moisture and stomach acid to maximize survival and delivery to the intestine. 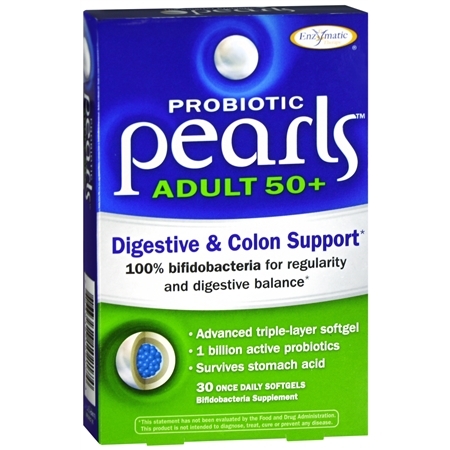 Which Probiotic Strains are in Probiotic Pearls Adult 50 Plus? What Are the Other Ingredients in Probiotic Pearls Adult 50 Plus? The other ingredients at the time of this writing (August, 2018) are: vegetable oil (palm, coconut), fish gelatin (tilapia), vegetable glycerin, soy lecithin, pectin, and silicon dioxide. It is a product of Japan. This softgel appears to be very similar to the Nature's Way Probifia Pearls which were made in Japan and are no longer distributed by Nature's Way. What is the Recommended Dosage of Probiotic Pearls Adult 50 Plus? The recommended dosage is one softgel daily that may be taken with or without food. However, you must not chew or crush the pearl or the probiotic's protection will be inactivated. What are the Pros of Probiotic Pearls Adult 50 Plus? There are not many Bifidobacterium-only probiotic supplements available on the market and this one has specific and well-known, documented strains in it. The triple-layer softgel pearl is a unique delivery method that may provide better delivery. In the digestive tract, most Bifidobacterium reside in the colon. Bifidos are more sensitive to stomach acid and bile than other probiotic genera, so protecting them until they reach their determined target may mean that less bacteria are needed to achieve results of higher-strength ones. Shelf-stable. No refrigeration is required, but it’s always a good idea to refrigerate probiotics, unless the label specifically says not to. Enzymatic Therapy is an FDA-registered drug facility (USP) which means that it meets higher standards than non-drug facilities. This facility is able to perform stability and bioavailable testing to ensure the product maintains its potency throughout its shelf life and releases its bacteria in the body. What Are the Cons of Probiotic Pearls Adult 50 Plus? Allergy alerts! The pearls contain fish and milk proteins as well as soy, coconut oil and palm fruit oil. According to the Enzymatic Therapy website, lecithin may contain trace levels of soy proteins but not enough "to provoke allergic reactions in the majority of soy-allergic consumers." The questions I would ask myself if I were allergic to soy are: Am I in the majority or the minority? 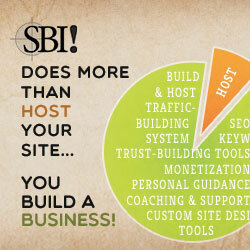 Am I willing to test it or can I find something else instead? This is a low-potency probiotic supplement. However, if the strains are delivered to the colon intact, this supplement may outperform higher-potency products with Bifidobacterium in them. Some negative or neutral, verified purchase Amazon.com reviews are listed below. There were not many available. Where Can You Find Probiotic Pearls Adult 50 Plus? Is Probiotic Pearls Adult 50 Plus the Right Supplement for You? As I mentioned, there are very few 100% Bifidobacterium probiotic supplements on the market today. If the allergies are of no concern to you, this is a good, albeit low strength, Bifidobacterium supplement. It is similar to the discontinued Probifia Pearls supplement, but has one extra bifido. There are also different formulation of the pearls with the same delivery method. Check out the dispensary for the Women’s, Acidophilus, Complete, Immune, and Elite formulas.